September 19, 2018 - Strategic Metals Ltd. (TSX-V: SMD) (“Strategic”) is pleased to announce results from the 2018 exploration program at its wholly owned Hartless Joe property, located 30 km east of Whitehorse, in southern Yukon. Soil sampling and prospecting have expanded the gold-rich system to an area that is 6.5 km long and up to 3.5 km wide (Figure 1). The property is favourably located in Stikinia terrane and has a similar geological setting to deposits found in the prolific Golden Triangle district of British Columbia. It is underlain by a package of volcanic and sedimentary rocks that are cut by steeply-dipping porphyry dykes, as well as numerous large-scale and complex faults. Mineralization occurs in steep quartz veins along faults and in stratabound, banded and/or comb-textured quartz horizons adjacent to calcite-chlorite-albite altered sills or flows, within inter-volcanic mudstones. Exploration in recent years focused on the northern part of the precious metal system, where multiple zones returned very high gold grades, including chip samples yielding 60 g/t gold over 1.2 m at the King Zone and 462 g/t gold over 0.4 m at the Queen Zone. Work in 2018 focused on the southern portion of the system, which covers the Grumpy and Gusano showings (Figure 2). The Grumpy Showing was discovered in 1997 by government geologists, who collected a sample of mineralized quartz during a regional mapping program. Subsequent exploration has identified a broad area of gold- and silver-bearing quartz-carbonate float, where thirteen rock samples averaged 37 g/t gold and 1391 g/t silver, with peak values of 251 g/t gold and 5010 g/t silver. In 2018, hand trenching at the Grumpy Showing exposed a steeply-dipping, mineralized quartz vein, within a dilational fault zone. 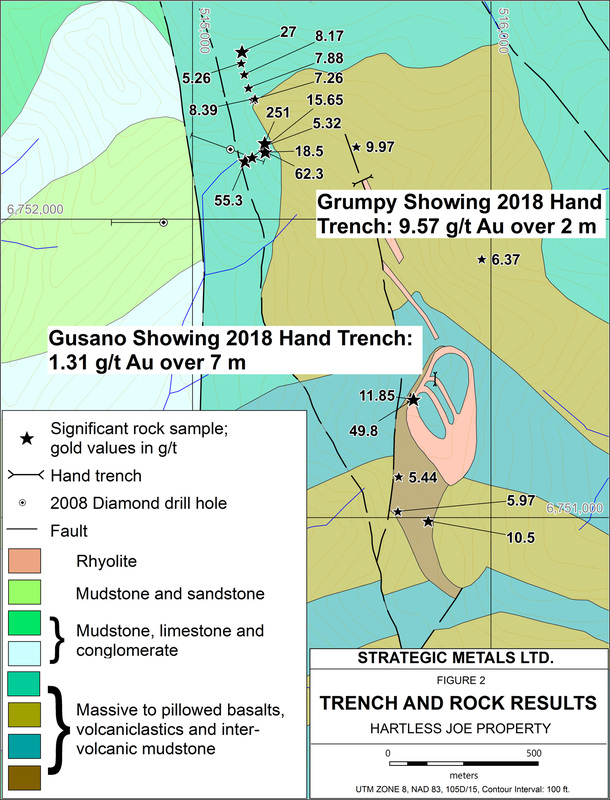 A continuous chip sample taken across this vein assayed 9.57 g/t gold over 2 m.
The Gusano Showing, located 700 m south of the Grumpy Showing, was discovered by Strategic Metals in 2017. It covers a vegetated slope that is underlain by a recessive mudstone unit. In 2018, a ridge-top hand trench successfully exposed a siliceous, mineralized horizon, which sits on top of a shallowly-dipping, rhyolite sill or flow. Chips samples taken along the floor of the trench averaged 1.31 g/t gold over 7 m. Rock samples collected from talus along a strike length of 500 m yielded up to 49.8 g/t gold and 365 g/t silver. The two trenches are the first bedrock exposures within these targets and are important because they define specific drill targets. 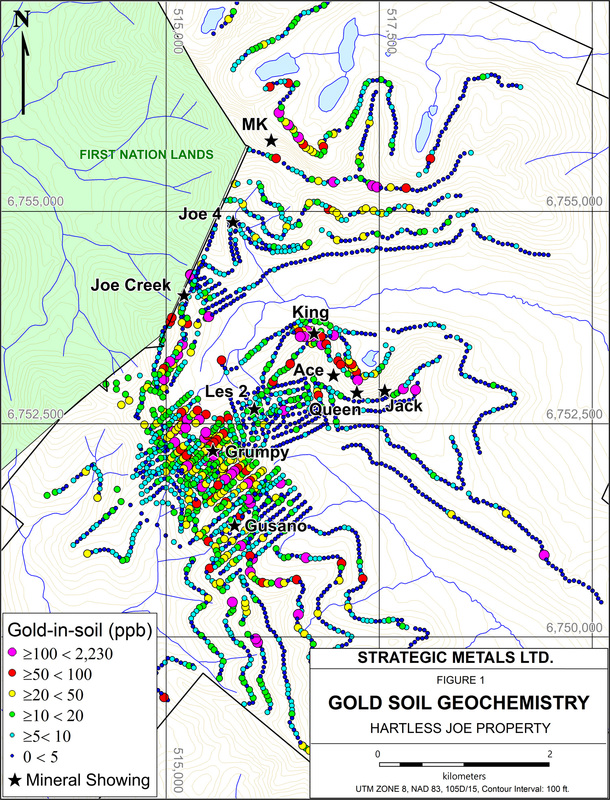 Additional maps, descriptions and photographs of the Hartless Joe property are available at www.strategicmetalsltd.com, while a NI 43-101 report can be viewed on SEDAR. Analytical work was done by ALS Minerals, with sample preparation in Whitehorse, Yukon and assays and geochemical analyses in North Vancouver, British Columbia. All rock samples were analyzed for gold by fire assay fusion and inductively coupled plasma-atomic emission spectrometry (Au-ICP21) and 51 other elements by aqua regia digestion and inductively coupled plasma-atomic emission spectroscopy (ME-MS41). For selected samples, >100 micron material remaining on the screen was then analyzed for coarse gold by fire assay with a gravimetric finish (Au-SCR21). Overlimit silver values were determined by four acid digestion with inductively coupled plasma and either atomic emission spectroscopy or atomic absorption spectroscopy (Ag-OG46). The 2018 field program on the Hartless Joe property was managed by Archer, Cathro & Associates (1981) Limited (Archer Cathro). Technical information in this news release has been approved by Jackson Morton, P. Geo., a senior geologist with Archer Cathro and a qualified person for the purpose of National Instrument 43-101. Strategic has recently filed NI 43-101 reports on SEDAR for its Hartless Joe, Meloy, CD, Hopper and Saloon properties.